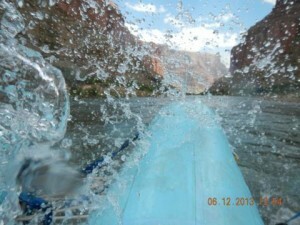 For our Grand Canyon tour, we were on two rafts and had 5 Western guides. The two Captains of the boats were very experienced and handled the rapids, us the guests, and the accommodations, the food, landings, side trips, canyon lore, and storytelling at night with great aplomb. We looked forward to the food and they exceeded our expectations over, and over again. There was cold shrimp cocktail, pork chops, great French Toast, fish, etc. As a 72 year-old I took many side trip trails, ran the water of the Little Colorado and saw many waterfalls and walked many side canyons. I brought 3 camera batteries; I should have brought 5. I did capture 6 gigabytes of pictures. It was a wonderful experience. Take the kids.